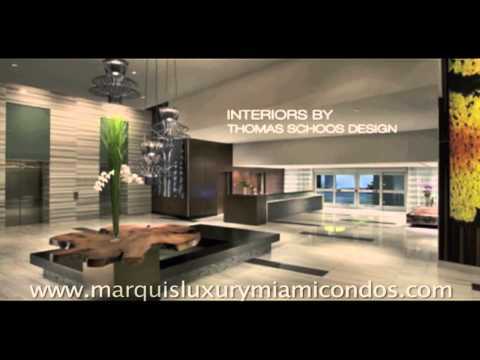 Marquis Residences is a luxury residential development located at 1100 Biscayne Boulevard in Miami’s Park West neighborhood. Rising 67 stories and standing 679 feet above sea level, Marquis Residences is the fifth tallest building in Miami. It offers unparalleled views of the Atlantic Ocean, Biscayne Bay, and Miami Beach skyline. Considered “the Crown Jewel of Miami”, Marquis was designed by world-renowned architecture firm Arquitectonica and developed by Leviev Boymelgreen Marquis Developers, LLC. Marquis Residences is a multi-award-winning development. Its accolades include two honors at The Developers & Builders Alliance’s 2007 Community Advancement Awards. Completed in 2009, Marquis is comprised of 292 condo residences plus a 129-room boutique hotel called ME Miami which is operated by Melia. Marquis Residences offers one-, two-, three-, and four-bedroom floor plans ranging in size from 1,477 to over 8,000 square feet (see Marquis Residences floor plans). The amenities at Marquis Residences include a lap pool, resort-style pool, two hot tubs, a poolside bar, fitness center, sauna, full-service spa, and full-service concierge. Marquis Residences is just a few short blocks from the Adrienne Arsht Center for the Performing Arts, the shops and restaurants at Miami Worldcenter, the American Airlines Arena, the Perez Art Museum Miami, and Frost Science Museum. By car, Marquis Residences is 5 minutes from the Port of Miami, 7 minutes from South Beach, 7 minutes from Brickell, and 15 minutes from the Miami International Airport. What is the pet policy at Marquis Residences? Marquis Residences allows pets for owners only. Tenants are not allowed to have pets. The pet policy permits only owners to have no more than two (2) pets, with a maximum total weight of 100 pounds. There is no pet fee. What are the rental restrictions for Marquis Residences condo? Owners may rent their units a maximum of two (2) times per year. No lease can be less than thirty (30) days. Which utilities are included in the Marquis Residences condominium association dues?